The National Environmental Policy Act (NEPA) requires that federal agencies implement certain procedures and supply documentation to the public when significant environmental impacts could result from activities on federal lands such as Lexam’s proposed drilling of two 14,000’ test wells on the Baca National Wildlife Refuge. Specifically, we are requesting all written documentation that is available, including an environmental analysis and the NEPA decision document. If these policies were not implemented and these documents do not yet exist, we would like to see the written documentation explaining why the BNWR is not in compliance with these federal statutes. We would be happy to accept copies of these documents today. As a physical geography professor and resident of the Baca subdivision, I have concerns regarding the Canadian company, Lexam Explorations, Inc.’s, proposed exploratory drilling in the Baca National Wildlife Refuge. Having read the scientific literature pertaining to the geology and hydrogeology of the San Luis Basin, I (along with many Valley “old-timers”), suspect that Lexam’s “gas drill play” may actually be a “water play.” I don’t think the COGCC would knowingly issue drilling permits to Lexam if they understood that: 1) the claimed presence of Mesozoic source rock (hence, gas and oil) may be based more on “science by assertion” than by rigorous science, and 2) the target of exploration may be the vast groundwater reserves of the San Luis Basin rather than fossil fuels. We know that in the current, industry-friendly political climate, some scientific experts may be motivated to fudge data in order to please their paymasters. Thus, just as we now know that the “intelligence” for WMD in Iraq was “fixed” to justify a preconceived policy, it seems possible that the “scientific evidence” now being used to justify gas and oil drilling in the San Luis Basin may also have been “fixed” in order to achieve a preconceived and altogether different objective. I) The conventional geologic wisdom is that Mesozoic source rocks for gas and oil are not found in significant quantity in the San Luis Basin (Keller and Cather, 1994). II) The groundwater underlying the valley floor, however, is worth a considerable amount of money. And there have been concerted attempts in the past two decades to gain control of this water resource for export and private profit. Perhaps if we put these two facts together, we can rightly deduce that the real purpose of Lexam’s exploratory drilling could be different than is currently being portrayed. As background, in the 1980’s and 1990s, there were two attempts to mine and export the vast water resources of the San Luis Basin. The first attempt was by Canadian company (American Water Development, Inc., or AWDI) and the second attempt was by the Baca Corporation. Both attempts failed, due in part to concerted efforts by local environmentalists. As further background, Aber (2002) notes that the confined aquifer of the San Luis Basin may be as much as 30,000 feet deep, that the valley fill consists of Oligocene-Holocene-aged unconsolidated sediments interlayered with volcanic strata, and that artesian wells yield up to 4000 gallons of water per minute. 1) The Rio Grande rift extended northward to create the San Luis Basin during the Oligocene (about 28 million years ago), and that basin fill is comprised of Tertiary and Quaternary sediments deposited during the past approximately 28 million years. 2) Structurally, the San Luis Basin coincides with two half-basin grabens (the Monte Vista and the Baca Grabens) separated by the Alamosa Horst. Mesozoic rocks which were deposited in this region were for the most part eroded and removed during regional uplift during the Laramide Orogeny, from about 65 to 50 million years ago (Brister and Chapin, 1994). 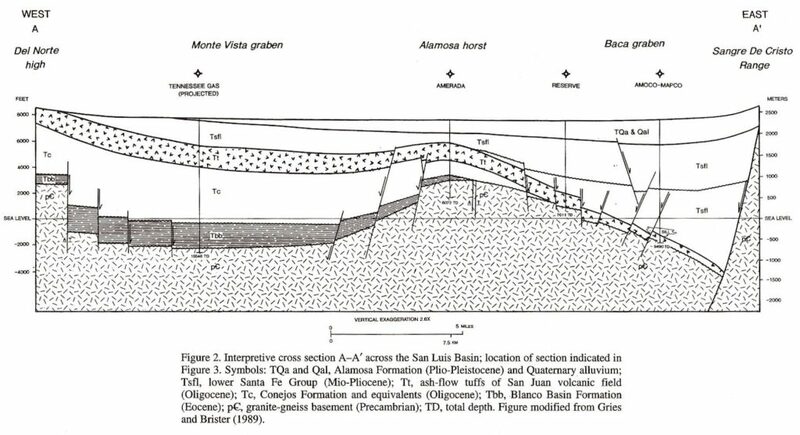 Geologic cross-sections by Brister and Greis (1994) (above) and Tweto (1979) (next page) show the major structures as well as the estimated ages of sediments in the northern San Luis Basin. 3) Again, authors of all peer-reviewed papers on the geology of the San Luis Basin agree that basin fill consists mainly of upper Oligocene to middle Pleistocene sediments (as much as 5.6 km thick), comprised of mudstones and coarse lithic sandstones and conglomerates, overlying Precambrian bedrock (Chapin and Cather, 1994; Kluth and Schaftenaar, 1994, Brister and Greis, 1994; Brister and McIntosh, 2004)). Their conclusions are based on seismic, gravity, and well data, as well radiometric dating and geologic mapping. None of these geological experts recognize the presence of Mesozoic hydrocarbon source rocks in San Luis Basin sediments. Thus, for example, Kluth and Schaftenaar (1994) conclude that the basin is filled with about 6.4 km (21,000) of mostly Tertiary sediments, Oligocene and younger in age. They also conclude that the angle of the (east) bounding fault of the Baca graben is about 60º, with 45º as an absolute minimum angle. 4) By contrast, a geologist who happens to work for Lexam Explorations, Inc., Thomas Watkins, has written a 7-page report that postulates that Mesozoic source rocks are abundant in the San Luis Basin (Watkins, no date given). These conclusions are justified based on re-interpretation of seismic data in addition to well data acquired in 1992 and 1993. Although this paper has not gone through the accepted scientific peer-review process, it provides the scientific basis for the report prepared by Toronto-based consulting group, Watts, Griiffiths and McQuat (Hoey, et al., 2006) that Lexam is using to justify its drilling program and fund-raising efforts. Note that Watkin’s/Lexam’s interpretation differs radically from all others in that sections of Mesozoic source rock are shown to be preserved along rotated blocks in the hanging wall of a low-angle (25 to 30º) normal fault that forms the (eastern) margin of the basin. Is this merely “science by assertion?” Perhaps what is needed is for Watkin’s ideas to be subjected to the standard peer review process that other geologists go through. 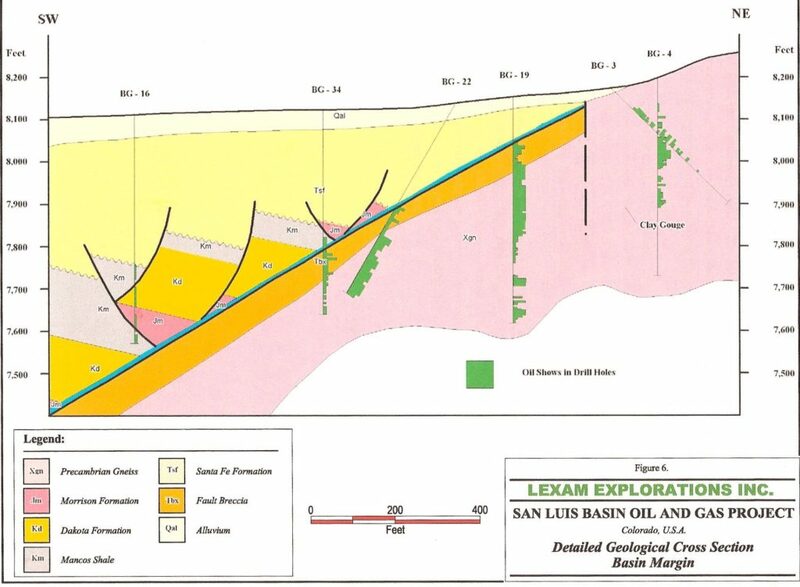 II) Regarding very salient fact #II, Lexam’s drilling of two 14,000’ exploratory wells could directly and adversely affect the quality and quantity of groundwater in the San Luis Basin. This groundwater occurs in two major reservoirs. The shallow, unconfined aquifer provides drinking water to our community and most, if not all, of the communities in the San Luis Valley. It also provides water for agriculture. The groundwater utilized for drinking water and irrigation is within 7 feet of the surface in some locations in a highly permeable sand formation. Any surface disturbance or spill due to drilling operations has the potential to impact the groundwater quality adversely. Thus, contamination of this unconfined surface aquifer could mean the loss of our groundwater resource for generations. In addition, it could have very negative impacts on downstream users of the Rio Grande River in New Mexico, Texas, and Mexico, all of which have treaty rights to surface water, which is affected and supplied by the much larger quantity of groundwater in the confined and unconfined aquifers. Thus, more specific information regarding groundwater flow directions is needed. The interconnection and interaction between surface water (streams and wetlands) and the unconfined and confined aquifers also needs to be evaluated. Specifically, more data is needed on the potential impacts of drilling on each of these interrelated parts of the surface water/groundwater system. Thus, a thorough evaluation of the groundwater system and an Environmental Impact Study (EIS) should be conducted before these test wells are permitted. This is indeed a special situation, where a federally-owned area set aside for the protection of the area’s ecosystem, has a privately-held mineral right. If this were a typical federal site, the National Environmental Policy Act (NEPA) would require that an EIS be conducted. The COGCC may not have a specific process for conducting an EIS or evaluating a site prior to authorizing drilling. However, before the COGCC issues drilling permits that would potentially damage this incredibly valuable resource, it is essential that EIS and groundwater evaluation be conducted by others so that scientifically-supported data can be provided to the COGC prior to well-permitting. In conclusion, the two most very salient facts surrounding this issue indicate that 1) the potential of finding a recoverable amount of gas is low, highly speculative, and even doubtful. 2) Groundwater, on the other hand, is arguably the SLV’s most precious resource. It supports our lives and livelihoods. It’s ownership and use is regulated by a complex set of laws involving several basin states as well as Mexico. Thus, it seems common sense that the water rights and surface-owner rights (especially those of a federally-protected Wildlife Refuge) are a much higher priority than a speculative mineral right. Clearly, the protection of this groundwater reservoir should be the highest priority. And the potential contamination (and potential theft by secretive and perhaps illegal tactics) of this vast reservoir of groundwater is an unacceptable risk. 1) other geological/hydrogeologic experts, such as the geologists referenced here, to determine if Watkin’s report is scientifically credible. Finally, and very importantly, 3) a way to discover whether Lexam’s real goal is determine the value and gain control of the groundwater of the San Luis Valley would be to carefully examine the sales and land transfer agreements between AWDI, the Baca Corporation, the Nature Conservancy, and the Baca National Wildlife Refuge. A careful reading of these documents by independent legal council could reveal whether Lexam, or some corporation in partnership with Lexam, could legally acquire the water rights under the BNWR and therefore, in the San Luis Valley. • Off-site disposal of all drilling wastes (liquid and solid), including drilling mud. • Utilize the Best Available Technology for installation of the well to protect all groundwater aquifers, such as concrete casing of the well to full depth. • Conduct groundwater monitoring, including existing water wells surrounding the drill sites and an alarm-well system around each drill site. • Consideration for safety and traffic on public roads. Of course, in addition to the protection of groundwater, many local groups are concerned about air quality in our nearby community. Based on the prevailing wind direction and the proximity of the mountains immediately to the east, any air discharges could concentrate in the community and air quality would be negatively impacted. Thank you for considering these concerns. We, the affected citizens of the San Luis Valley, count on you doing the right things to protect the quality of our environment. Brister, B.S. 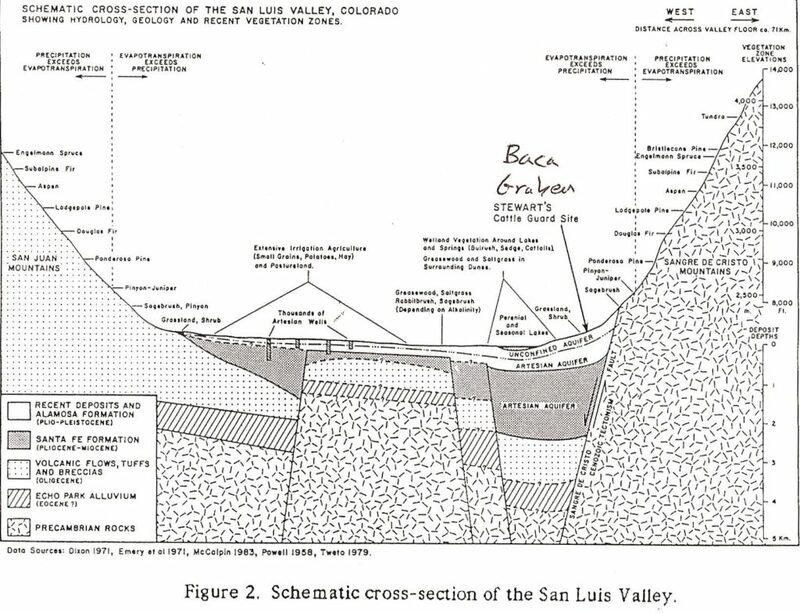 and Chapin, C.E., 1994, Sedimentation and tectonics of the Laramide San Juan Sag, Southwestern Colorado, The Mountain Geologist, Vol. 31, No. 1, p. 2- 18. Brister, B.S. and Gries, R.R., 1994, Tertiary stratigraphy and tectonic development of the Alamosa basin (northern San Luis Basin), Rio Grande rift, south-central Colorado. In: Keller, G.R. and Cather, S.M. (eds. ), Basins of the Rio Grande Rift: Structure, Stratigraphy, and Tectonic Setting. Geological Society of America Special Paper 291, Boulder, Colorado, p. 39-58. Brister, S. and McIntosh, W.C., 2004, Identification and correlation of Oligocene ignimbrites in well bores, Alamosa Basin (northern San Luis Basin), Colorado, by single-crystal laser-function 40A/39A geochronology of well cuttings. New Mexico Bureau of Geology and Mineral Resources, Bulletin 160, p. 281-296. Chapin, C.E. and Cather, S.M, 1994, Tectonic setting of the axial basins of the northern and central Rio Grande rift. In: Keller, G.R., and Cather, S.M. (eds. ), Basins of the Rio Grande Rift: Structure, Stratigraphy, and Tectonic Setting. GSA Special Paper 291, Boulder, CO, p. 5-25. Hoey, N.P. (of Watts, Griffis, and McQuat), Watkins, T.A., and Parsons, K., 2006, A summary review including a work plan and budget proposal to test oil and gas prospects on the San Luis Basin Property, Colorado, USA, for Lexam Explorations, Inc.
Keller, G.R. and Cather, S.M., 1994, Basins of the Rio Grande Rift: Structure, Stratigraphy, and Tectonic Setting, Geological Society of America Special Paper 291, Boulder, Colorado. Kluth, C.F. and Schaftenaar, C.H., 1994, Depth and geometry of the northern Rio Grande Rift in the San Luis Basin, south-central Colorado. In: Keller, G.R. and Cather, S.M. (eds.) Basins of the Rio Grande Rift: Structure, Stratigraphy, and Tectonic Setting. GSA Paper 291, Boulder, Colorado. Watkins, T.A. (no date given). Geology of the northeastern San Luis Basin, Saguache County, Colorado, 7 pp. The __________________ has some concerns regarding the proposed drilling in the Baca Wildlife Refuge. The shallow groundwater aquifer provides drinking water to our community and most, if not all, of the communities in the San Luis Valley. It also provides water for agriculture. The groundwater aquifer utilized for drinking water and irrigation is within 7 feet of the surface in some locations in a highly permeable sand formation. Any surface disturbance or spill due to drilling operations has the potential to impact the groundwater quality. Contamination of groundwater could mean the loss of our groundwater resource for generations. Specific information regarding groundwater flow direction is needed. The interconnection and interaction between the surface and subsurface needs to be evaluated, including the presence of wetlands in the area. We request that a thorough evaluation of the groundwater system and an Environmental Impact Study (EIS) be conducted before these test wells are permitted. This is a special situation, where a federally-owned area, set aside for the protection of the area’s ecosystem, has a privately-held mineral right. If this were a typical federal site, the National Environmental Policy Act (NEPA) would require that an EIS be conducted. Although the Colorado Oil & Gas Commission (COGCC) may not have a specific process for conducting an EIS or evaluating a site prior to authorizing drilling, this is a unique situation. We are not requesting that the COGCC conduct the EIS or the groundwater evaluation themselves if it is not part of your process, but to allow time for these evaluations to be conducted by others so that scientifically supported data can be provided to the COGC prior to well-permitting. The potential of finding a recoverable amount of gas is speculative. Groundwater is arguably the SLV’s most precious resource; it supports our lives and livelihoods. When are water rights and surface-owner rights (especially a federally-protected surface) considered a higher priority than a speculative mineral right? The protection of groundwater should be the highest priority. Contamination of groundwater is an unacceptable risk. In addition to the protection of groundwater, we are also concerned about air quality in our nearby community. Based on the prevailing wind direction and the proximity of the mountains immediately to the east, any air discharges could concentrate in the community and air quality would be negatively impacted. Thank you for considering our concerns and requests. Fund-Raising Letter for Water Watch Alliance with the “Help” of San Luis Valley Ecosystem Council (SLVEC). $8700 was raised from the Crestone/Baca Community. Of this amount, SLVEC (Chris Canaly) kept all of it, paying herself and the SLVEC without consulting WWA. You may have already heard of the possibility of natural gas drilling occurring only a few miles west of the Baca community on the new Baca National Wildlife Refuge. We are asking for your help now to save our spectacular environment and way of life here in the Crestone Baca Community and San Luis Valley. The volunteer Lexam working group has had several meetings over the last few months to gather information and inform the community and ourselves about the consequences of oil and gas exploration and drilling. We are calling ourselves The Water Watch Alliance (WWA), since water is really the key to maintaining the quality of the environment and economy in this spectacular, sensitive, and pristine area.
? Lexam Explorations, Inc., a Canadian firm, has applied for permits to the Colorado Oil and Gas Conservation Commission (COGCC) to drill two 14.000’ gas test wells in the Baca Refuge just west of the Baca subdivision. Through recent land transfer agreements, Lexam owns the mineral rights under the Refuge. Drilling the two test wells is considered a wildcat, high risk, and speculative endeavor. But they are willing to gamble $10 million to reap potentially huge profits if they strike a large reservoir of natural gas. Once the test drill permits are issued, Lexam does not have to apply for another permit to mine gas from those particular wells.
? Legal Research needs to occur now regarding a surface agreement that is in place between the Baca National Wildlife Refuge and Lexam that apparently allows Lexam access those mineral rights. We need legal expertise from National Environmental Policy Act (NEPA) lawyers to review this agreement so that pressure can be applied to the U.S. Fish and Wildlife Service to do an Environmental Impact Statement (EIS) or Environmental Assessment (EA) on the proposed drilling.
? We are currently exploring and implementing several strategies including mounting letter writing campaigns to political representatives and the COGCC, outreach to media, and research and learning from western slope communities which have been the hardest hit, and finally, outreach to elders in Native American communities. As other Rocky Mountain communities have learned through hard experience, full-scale gas production activities can devastate pristine environments by adding toxic pollutants to air and water (both surface water and groundwater) and cause many other negative impacts on human communities and wildlife. Recently, a small group of Baca residents went to visit the area just south of Silt and Rifle, Colorado, to examine the impacts of Encana’s massive gas production activities on local communities. The majority came back ill from their brief (less than 2 hours) exposure to air pollution from the gas drilling, which includes ground level ozone and a suite of carcinogenic compounds. Today, the San Luis Valley may be the last, relatively unspoiled and pristine mountain basin in Colorado. But that could change dramatically if Lexam discovers commercially-viable levels of gas or oil in the San Luis Basin. The pollution, noise, environmental degradation, and “boom-town” effects that would accompany full scale production could destroy the qualities of pristine beauty and profound silence that originally drew many of us to this special and sacred place. The San Luis Valley Ecosystem Council, which has agreed to sponsor this mailing and which is a 501c3 non-profit corporation. Your donations are tax deductible. Please put “Lexam Research” in the memo of your check. If you would like to participate in WWA, please contact us. You are contributing to your own well being. Thank you for your concern. We of the Water Watch Alliance (WWA) in Crestone, CO would like to update you and your community on recent developments concerning the Canadian company, Lexam Explorations Inc.’s plan to drill two 14,000’ gas test wells on the newly-created Baca Fish and Wildlife Refuge just west of the Baca Grande Subdivision. We are concerned that oil and gas drilling in our area could adversely affect our shared surface and ground water resources, cause health problems for humans and other species, and despoil the pristine character of the San Luis Valley. Attached please find Lexam’s July 3, 2007 press release which states that: 1) their recent 3-D seismic tests show strong potential for oil and gas deposits, and 2) the San Luis Valley Ecosystem Council has filed a Complaint against the U.S. Fish and Wildlife Service (USFWS) claiming that the USFWS has not complied with the National Environmental Policy Act (NEPA). The press release also states that Lexam will not start drilling until this lawsuit is resolved. 1) At this point, the U.S. attorneys agree with the San Luis Valley Ecosystem Council’s lawsuit and will likely require that the USFWS conduct a NEPA process, which would probably mean they have to conduct an Environmental Assessment (EA) before drilling can begin. This process would probably delay the actual drilling by at least one year. 2) Meanwhile, in order to protect the interests of our local community, the Baca Water and Sanitation District recently turned down Lexam’s request to use our local water for drilling purposes. If Lexam approaches you to purchase water for drilling, we encourage you to consider all the potential ramifications of gas and oil exploration in an area which is effectively upstream from your community. In order to share information and educate people in the San Luis Valley regarding these issues, we plan to sponsor an educational conference on August 25, which will feature local experts who will speak to various aspects of this important issue. We would welcome your participation in this event and will be sending you more details about this event soon. We, Water Watch Alliance (WWA), are happy to learn that the Baca FWS will be conducting a scoping process. However, we are extremely concerned that by scheduling the Lexam EA/scoping process meeting on Friday, August 17, the USFWS has not provided sufficient time for us to develop our input for the meeting or to notify the community through our local newspaper, The Crestone Eagle. As you know, this monthly publication is the primary means through which our community is informed about upcoming events. WWA was notified of this meeting through an email sent at 4:44 pm on 8/7/07. In the interest of fairness to all parties, we request that this meeting be postponed until we can have adequate time to prepare and notify members of this community who will be directly impacted by drilling activities on the Baca Wildlife Refuge. In addition to postponement of this meeting, we request that additional meetings also be scheduled on later dates to allow ample opportunity for members of the Crestone/Baca community to participate in this public process. The NEPA glossary of the Fish and Wildlife Service NEPA Reference Handbook defines “scoping” as: “An early and open process for determining the extent and variety of issues to be addressed and for identifying the significant issues related to a proposed action” (40 CFR 1501.7). We believe that an “open process” to determine “the extent and variety of issues” requires, first, that we, the community, be given sufficient notification so that we have time to prepare meaningful input into the scoping process; and, second, that the scoping process consist of several public meetings over a several month period. The USFWS NEPA glossary also defines Environmental Assessment (EA) as “a concise public document, prepared in compliance with NEPA, that briefly discusses the purpose and need for an action, alternatives to such an action, and provides sufficient evidence and analysis of impacts to determine whether to prepare an environmental impact statement or no significant impact.” We believe the potential impacts of drilling two 14,000’ gas test wells in the middle of a wetland – wells that would penetrate 14,000’ into aquifers – are significant and adverse. We believe that the EA will indicate that a full EIS is required. As the nearest community and the community most impacted, the Crestone/Baca community deserves the same opportunity to make our case during the EA/scoping process as Lexam has been given to make theirs. Since the next issue of the Crestone Eagle will be published on September 1, 2007, we recommend that the Friday, August 17th meeting be postponed until an evening during the second full week of September (the 11th to the 15th) or later. We would also like to take this opportunity to invite you to a public, educational forum, entitled “Oil and Gas in the San Luis Valley?” on August 25, 2007 (see attached flyer). We hope that this educational forum can play an important part in the scoping process. As per our phone conversation just now, we at the Water Watch Alliance (WWA) would very much appreciate it if you could notify Senator Salazar re: this situation and pass along our request that he try to help us however he can. I am faxing three notices with this cover letter. And we would welcome the Senator and/or you and/or another of his aids to attend our Forum: Oil and Gas in the San Luis Valley? August 25, 2007, 10 to 5 pm. At a recent meeting with our Crestone/Baca community (8/17/07), the USFWS initiated an EA/scoping phase of the NEPA process, requesting that local citizens write-in our concerns re: the proposed drilling of two 14,000’ gas test wells by a Canadian corporation, Lexam Explorations, Inc., on the BNWR. We of Water Watch Alliance (WWA, formerly San Luis Valley Citizen’s Alliance) and I as a citizen of the Baca have many concerns regarding the adverse impacts of Lexam’s proposed drilling on sensitive wetlands of the Wildlife Refuge within 1.5 miles of the Baca community. It is our (WWA) opinion that there are numerous reasons that gas and oil exploratory drilling on the Baca Refuge constitutes an “incompatible use” with that of protecting and preserving fish and wildlife habitats as well as the health and viability of human communities and agricultural operations in the San Luis Valley (SLV). In addition, “downstream” communities in New Mexico, Texas, and Mexico, located in the lower portions of the Rio Grande drainage basin, may also be adversely affected by contamination of surface water from the drilling project. The rights of these downstream users are protected by the Rio Grande Compact. We conclude that: 1) many of the inevitable damages caused by gas exploration drilling in this sensitive area cannot be mitigated and therefore should not be allowed, and 2) due to directives from Washington, D.C., the USFWS is out of compliance with many of the federal regulations it is bound by law to follow and enforce. It is mandated by law that the BFWR conduct a full-blown NEPA process. Even so, the BNWR announced last fall that it was not required to conduct a NEPA process. Today, it is conducting this process, but only in response to a lawsuit filed by our SLVEC/WWA lawyers. The BNWR is now conducting an Environmental Assessment, which suffices as the short version to fulfill legal requirements when the proposed activity is found to cause no significant impacts. However, given the well-documented, adverse impacts of gas drilling elsewhere in Colorado and the West (OGAP, 2005) and given the extremely sensitive nature of wetland ecosystems and aquifers on and under the Baca Wildlife Refuge, we of WWA believe that the USFWS is legally and morally obligated to conduct a full-blown EIS (Environmental Impact Statement) as well as complete their own Management Plan before allowing any drilling to occur on the Refuge. By conducting a full-scale Management Plan, the BNWR will be able to establish base-line data on air quality, water quality, and the ecosystem itself, including delineation of sensitive species requirements, etc. We would hope these data would be shared with local and state health officials, the POA, Saguache County officials, etc. before any exploratory drilling is allowed. Lexam Explorations, Inc., which owns 75% of the mineral rights, is a small Canadian company that has never operated an oil or gas well. They will use subcontractors to carry out their drilling; they don’t intend to operate anything. The remaining 25% of the mineral rights are owned by Conoco-Phillips. If Lexam “strikes it rich” and finds a “tcf” (trillion cubic feet) of natural gas, as they hope, their $20 million investment could provide a windfall financial profit for their 2200 shareholders of between $1 billion and $18 billion. Lexam would then immediately sell out to major oil companies such as Conoco-Phillips, which would then proceed to turn the SLV into a toxic, industrial park. I have visited the gas fields south of Silt, Colorado and talked with local property owners there whose lives have become a prolonged nightmare. People’s health, quality of life, and property values are severely and adversely impacted. In addition, it is now well understood that burning fossil fuels contributes to global climate change. One estimate is that the burning of a “tcf” of natural gas would produce about 150 million tons of carbon dioxide, a greenhouse gas. In Europe, production of this amount of CO2 would be taxed at the rate of nearly $2 billion. William Blake’s image of “Dark Satanic Mills” dotting the 19th century English countryside might then be an apt description of what our own San Luis Valley could look like as an industrial gas field. Meanwhile, the collective benefit to the nation of a successful gas play here would be to obtain sufficient natural gas to supply the US for perhaps a couple weeks only. And the equivalent amount of energy can now be much less harmfully produced using green energy, including solar, wind, and geothermal energy, which, ironically, are very abundant in the SLV. 1) Pollution and degradation of surface water (wetlands) and subsurface water in the unconfined and confined aquifers. Much of the BNWR consists of seasonal wetlands, which are among the most sensitive and important ecosystems in terms of their importance for supporting a large variety of species. Underneath the BNWR is 14,000’ to 15,000’ of sediments overlying Precambrian bedrock. An impermeable layer of clay, 10 to 80’ thick separates the surface (unconfined) from the subsurface (confined) aquifers. However, there are probably as many as 30 distinct aquifers contained within the confined aquifer (Dr. James McCalpin, pers. comm., 2007). Water pressure increases as you descend in the aquifer, therefore (polluted?) water will tend to rise (and mix) through the aquitards and aquifers. In the unconfined aquifer, water table is quite shallow (about 12’ or less) and hence, any addition of pollutants will likely contaminate surface water essential to a wide variety of human and non-human users, both in the near-term and in the future. This relatively shallow unconfined aquifer provides drinking water to our Baca community and most other SLV communities. It also provides the water needed for fish and wildlife, including over 70 species of rare plants and animals, agriculture in the San Luis Valley, and water usage throughout the Rio Grande basin. There are currently about 7000 wells in the SLV, of which about 1800 are “deep wells” that penetrate the confined aquifer. There is a significant danger of contaminants from the Lexam drilling operation leaking and irrevocably polluting the San Luis Valley aquifers. If the drillers encounter the Dakota Sandstone, a “reservoir rock” that they hope to find, they will in probably use hydraulic fracturing fluids, which can be highly toxic. This poses a threat to the whole Rio Grande region’s water supply and wildlife for future generations. The state of Colorado, which technically owns most of the water, has recently imposed a moratorium on drilling in the confined aquifer. Why is Lexam Explorations, Inc. exempt from this moratorium? Given the magnitude of adverse impacts of the drilling and the potential future value of water in the aquifer (probably many billions of dollars), exploratory gas drilling is an “incompatible use” with the Wildlife Refuge. Chemical contamination of groundwater: Dr. Theo Colborn has analyzed the chemical compounds involved in the gas well drilling process by studying Material Safety Data Sheets. Of particular concern is the process of hydraulic fracturing which utilizes a suite of especially dangerous chemicals. Such fracturing operations may require up to a million gallons of fluid per well (Gwen Eifle, OGAP, pers. communication, 2007). Colborn determined that of the 245 chemicals commonly used in drilling, 91% have adverse health effects and there is no information on the other 9%. Of the 91%, 35% are endocrine disrupters for people and wildlife. Some of the most toxic chemicals include BTEX (benzene, tolumene, ethylbenzene and xylene) which are carcinogenic, methane, diesel fuel, hydrogen sulfide, heavy metals, VOCs (volatile organic compounds), formaldehyde and PAHs (Colborn, 1997). On viewing the list of chemicals used, Professor Clay Bridgford, an ex-military man in Crestone, referred to this suite of chemicals as “a laundry list for chemical warfare.” Many of these chemicals have been found in contaminated wells and in grab samples for air quality near gas wells in Colorado and elsewhere in the west (OGAP, 2005). According to OGAP’s Gwen Lachelt (pers. comm., 2007), due to the current industry-friendly administration, every chemical used is considered propriety by the gas and oil drilling industry and this industry is exempt from following the Clean Water Act and other laws that limit and regulate use of toxic chemicals in the U.S. Drillers also use propolene glycol (an antifreeze) on well pads. When ingested, this chemical is fatal for animals. Hence, pad areas always need to be fenced. However, in practice, they typically are not fenced (OGAP, 2005). Even closed-loop systems still utilize open, evaporation pits, which often contaminate surface water, poison creatures, and add toxic pollutants to the air. Inadequacy of concrete well casing: The COGCC issued a permit to Lexam specifying that they only need to use double concrete casing in the well for the upper 3500’ of 14,000’ wells. Clearly, there is great potential for contamination of the confined aquifer if the well hits gas and oil and if the casing leaks in the future. . It is well-known that cement casings lose their integrity over time and can become a source of groundwater contamination for decades and centuries (OGAP, 2005). It is also commonly known that one quart of oil can contaminate up to 250,000 gallons of water. Thus, double concrete casing should extend the entire depth of any well. Needs of future generations: Future generations of humans and other organisms will depend on the quality and quantity of water in the SLV aquifers. A recent study on global warming concluded that by the year 2050, Colorado residents will have to subsist on 30% less water than present. Contamination of the water supply, then, could have disastrous consequences. Two individuals, Canadian Maurice Strong (AWDI) and local Colorado-resident, Gary Boyce (the Baca Corporation), tried, unsuccessfully, to make billions by exporting water from the SLV to the Denver area. So we can speculate that the value of the water is potentially as great or possibly much greater than that of any oil or gas that may be present. Clearly, more scientific studies are required to determine the potential value of the SLV aquifers as well as to determine how best to protect the quality and quantity of the aquifers. Water from the Rio Grande River is allocated to three states (Colorado, New Mexico, and Texas) and Mexico and is regulated by the Rio Grande Compact. Potential degradation of water in the SLV aquifers could affect the quality of surface water available to downstream users in these areas in the future. We hope that the Rio Grande Water Conservation District becomes more involved in this issue to help protect water quality and quantity for farmers and downstream users. Solution: A moratorium on drilling. Because access to fresh potable water in the semi-arid West will probably increase in the future, the Governor of New Mexico has recently imposed a moratorium on gas and oil drilling on the Otero Mesa until such scientific studies are complete. We suggest that our governor and/or our federal representatives do the same in this region. 2) Air pollution: Chemicals used in natural gas development are dangerous to the health of living creatures (animals, plants and humans) who happen to live near the drilling operations. Emissions from drilling pads emit carcinogenic toxic chemicals into surrounding public lands and communities. Ground level ozone causes degenerative health problems for humans, wildlife, plants and agricultural crops. It is the #1 cause of asthma. Because ground-level ozone is produced at every gas well pad, each well needs a special permit to exceed air quality standards required by the state and U.S. government. In addition, after gas comes to the surface, a dehydrator is used to separate the gas from the condensate, which includes a complex of volatile carcinogens, called BTEX, which includes ethyl benzene, xylene, and tolumine. In addition, PM-10 (airborne particulate matter less than 10 microns in diameter) has serious negative impacts on crops and human health. In order to monitor air quality in the BNFWR, it will be necessary to coordinate activities with the following organizations: Colorado Air Quality Control Commission, Colorado Water Quality Control Commission, Colorado Division of Wildlife, Local county weed programs, Bureau of Land Management, and Saguache County. It will also be necessary to conduct preliminary baseline studies on present air quality. 3) Health Concerns: Based on analysis of data in the Chemicals Used in Natural Gas Development Spreadsheets, Dr. Theo Colborn found that of the chemicals used, 49% can cause skin/sensory organ toxicity, 47% can cause respiratory problems, 47% are neurotoxins, 43% are gastro-intestinal/liver toxicants, 38% are kidney toxicants, 33% are carcinogenic, 29% are cardio/vascular/blood toxicants, 27% are immune system toxicants, 25% are developmental toxicants, and 13% are endocrine disruptors. In addition, of the chemicals on the list, 20% are biocide products that kill all life. Of the chemicals that are soluble in water (13%), 72% are neurotoxicants, 61% are gastro-intestinal/liver toxicants, 61% are reproductive toxicants, 61% are skin and sensory organ toxicants, 56% are respiratory toxicants, 50% are kidney toxicants, 39% are cardiovascular toxicants, 28% are endocrine disruptors, and 22% are wildlife toxicants. Furthermore, And furthermore, of the chemicals used in natural gas drilling that vaporize, 66% are neurotoxicants, 60% are gastro-intestinal/liver toxicants, 52% are respiratory toxicants, 45% are kidney toxicants, 43% are reproductive toxicants, 37% are cardiovascular/blood toxicants, 33% are carcinogens, 27% are immuno-toxicants, 14% are endocrine disruptors, and 4% are wildlife toxicants. 4) Impacts upon wildlife: Rare flora and fauna in the San Luis Valley, some found nowhere else in the world, include, the Great Sand Dunes tiger beetle, the giant sand treader cricket, the Rio Grande cutthroat trout, the southwestern willow flycatcher, and the slender spiderflower. Other species found in the area include the bald eagle, sandhill crane, pronghorn antelope, elk, mule deer, bighorn sheep, mountain goats, mountain lion and black bear. 5) Noise, light, and dust pollution: The proposed drilling, located about 1.5 to 2 miles west of the Baca residential community, will produce inevitable noise, light, and dust pollution which will degrade the quality of life for members of the Baca community as well as the habitats of fish and wildlife on the Refuge. In addition, heavy truck traffic associated with various aspects of the operation will significantly increase noise and dust. Compressor stations, if built, produce noise as loud as a jet airliner “24-7” (24 hours a day, 7 days a week. Crestone/Baca includes many spiritual groups and individuals who have moved here because of the pristine beauty of nature and the awesome and profound silence that the area affords. These spiritual groups will be adversely impacted by the drilling operations, in particular. 6) Damage to local roads due to use of heavy vehicles: We can expect that heavy traffic by heavy vehicles will result in damage to local roads and the increase of traffic accidents. Will Lexam pay for the damage their operation causes to existing infrastructure? 7) Infrastructure requirements: There is currently no infrastructure in the SLV that would support gas production. Building such an infrastructure would require construction of gas pipelines, gas compressors, building of innumerable gas well pads, building extra roads, etc. The synergistic effects of these kinds of operations would significantly degrade the pristine quality and quality of life in the San Luis Valley for many residents. Oil spills, truck crashes and highway deaths resulting from those crashes would be highly likely. 8) Boom-town effects: If Lexam strikes gas, we can expect that a suite of highly disruptive “boom-town effects” would accompany the gas boom. Other communities which have been subjected to this process have experienced varying degrees of chaos, social upheaval, negative impacts on schools, emergency services, crime rates, etc. And typically, after gas companies create problems, the local tax payers have pay the cost of the damages, road repair, etc. This pattern repeats in many ways, with local communities paying for extra schools, roads, etc. that industry needs in order to function. Meanwhile, what percentageof the profits are shared with local counties? Often, little to none. 9) Damage to local cultural, spiritual and native American values: The NEPA process requires that the USFWS try to understand the cultural values of the Crestone/Baca community. Our community is comprised of numerous communities and individuals committed to the preservation of pristine nature, developing more sustainable living models, and pursuing spiritual retreat in one of the world’s truly magnificent natural settings. Every fall for many years, for example, our town has sponsored an energy fair, which displays alternative and renewable means of creating energy. The San Luis Valley itself has long been acknowledged as one of the great spiritual centers of the world. It is commonly claimed around here that since pre-historic times when several Native American nations would gather in this “Bloodless Valley” bloodshed between peoples’ was not permitted. Mount Blanca, at the southern end of the valley, is one of the four sacred mountains of creation for Hopi and Navajo Indians. In practice, both the SLV and Mount Blanca are such recognized as cultural/spiritual sites of great importance to various Native American groups. And over the past few decades, the Baca Grande community has become home to many international spiritual centers and spiritual masters of various faiths including Christian, Buddhist, Hindu and others. These diverse cultures, faiths and retreat centers provide the sanctuary and retreat that both residents and visitors seek. Perhaps the inevitable question now is: Is the fossil fuel industry today more powerful than the U.S. government? Given that our president and vice president are both fossil fuel industry insiders and have manipulated our government so as to remove the impediments of federal regulations in an effort to maximize industry’s profits, it seems that yes, the oil/gas companies are now more powerful than our government. Bitter Root National Forest Supervisor Gloria Flora stated: “Why are they going to the best places first? They are going to the best places first because if they can get in there, there is nowhere they can’t get in.” (I paraphrase, her actual comment can be heard on the excellent movie- A Land Out of Time). Could Lexam be acting in coordination with a government/corporate strategy, perhaps outlined in Vice President Cheney’s (still classified) Energy Task Force documents? Could their strategy, in fact, be to drill in the most environmentally sensitive areas as soon as possible so as to derail any possible citizen opposition to their goal of turning the American West into a national energy colony, or in fact, a “National Sacrifice Area?” Could their strategy be to wage covert chemical warfare against the American people using toxic drilling chemicals? Could it be a deliberate plan to lower or even destroy property values of American citizens? Or might it be part of a larger UN Agenda 21, whereby lands are to be confiscated from the American people in order to be designated as federal lands, only to be later offered up to corporations through federal sell-offs and mineral-rights give-aways? All these questions should be addressed and answered by the Draft EA if it is to be in compliance with the NEPA process and not merely a whitewash. a. Installations must determine whether they have any properties of traditional religious or cultural significance to Native Americans. b. Installations with such properties are required to follow the requirements of Section 106 of NHPA regarding consultation with Native Americans if the BRAC activity constitutes an undertaking as defined in the ACHP regulation (36 CFR 800.16(y)). Further information on Section 106 is available at ACHP website at www.achp.gov/work106.html. Since native peoples in antiquity typically camped near water and since there are abundant seasonal wetlands on the BFWR, there are undoubtedly countless artifacts and sites on the Baca Refuge which have not been catalogued or recorded. Again, the BNWR needs to complete a survey of actual resources on the Refuge before allowing any drilling to occur. It shall be the policy of the United States to protect and preserve for Americans their inherent right of freedom to believe, express, and exercise the traditional religions of the American Indian…, including, but not limited to access to sites, use and possession of sacred objects. Has the BNWR queried all the native groups which might believe that sacred sites are located on the Refuge? In managing federal lands, each executive branch agency with statutory or administrative responsibility for the management of federal lands shall… avoid adversely affecting the physical integrity of such sacred sites. Native American Graves Protection and Repatriation Act (NAGPRA) and its implementing regulations at 43 CFR 10, the Archaeological Resources Protection Act (ARPA), NEPA Executive Orders 13175, 12898, and DOD Instruction 4715.3. In addition to many potential sacred sites on the 100,000 acre lease area of the BNWR, there are many spiritual groups located a few miles to the east of the proposed wells in the Crestone/Baca community. These include a Carmelite Catholic monastery, a Hindu Ashram, several Tibetan Buddhist temples and retreat spaces, a Zen Buddhist retreat center, etc. 10) Inadequacy of inspections. Whereas the number of oil and gas wells in Colorado has climbed 30% to 29,000 since 2000, the COGCC inspections have not kept pace. The state has just 8 inspectors, just one for every 3,625 wells. Therefore, we recommend that a qualified engineer be added to the team of inspectors. Deb Phenecie of the Baca Grande Water and Sanitation district is an engineer, she has experience in the gas fields of Wyoming, and she has volunteered to be an inspector. Peggy Utesch, a member of the Grand Valley Citizen’s Alliance in Garfield County, stated: “We know that every day there are accidents and incidents in the field- just look at the commissioner’s reports.” Based on the track record of the COGCC, we at WWA do not believe they have the capability to adequately monitor drilling activities on the BNWR. 11) Inadequacy of $10,000 bond: Given the potential value of water stored under the San Luis Valley is probably many billions of dollars, a more accurate and adequate bonding amount might be $5 billion. 12) Pressure on government agencies to expedite gas and oil drilling and downplay adverse environmental impacts: In 2001, President Bush signed Executive Order 13212 (Actions to Expedite Energy-Related Projects) which mandated that all federal agencies put new oil, gas, and coal projects on a fast-track, priority footing. Simultaneously, the Bush administration drastically cut funding to federal agencies and regulatory agencies, so they are now typically too short-staffed and under-funded to enforce the existing laws that regulate the oil/gas industry and protect communities and the environment. In particular, this administration has targeted the USF&WS with draconian cutbacks. One recent study showed that 90% of the changes that local people wanted were already in the existing rules and laws, but that these laws were no longer being enforced. Of course, it is well known that Bush and Cheney have deep roots in the oil/gas industry. 13) Legal and constitutional issues: Lexam’s acquisition of mineral rights:. Canadian billionaire Maurice Strong of AWDI (American Water Development, Inc.) severed the mineral rights from the surface rights on the Baca Grande Ranch when he owned the ranch back in the 1970’s. Lexam Explorations, Inc., is headed by another Canadian billionaire, Rob McEwen, the former CEO (and still largest shareholder) of Canada’s Goldcorp Inc. and current CEO of U.S. Gold. Lexam purchased 50% of the hard mineral rights from Baca Minerals (Strong) in 1987 and the other 50% of the oil and gas rights on the Baca Grande ranch from Newhall Land and Farming Company for $1 million. It acquired an additional 25% of the oil and gas rights from the Baca Corporation in 1996 from Gary Boyce for $1 million. Boyce, in turn, purchased these rights from Maurice Strong. The remaining 25% of the oil and gas rights is owned by Conoco-Phillips. Lexam acquired surface access and use by fee simple ownership and a Surface Use Agreement with AWDI (i.e., Maurice Strong) in 1992 for $1 million. This agreement is a 20-year paid up lease that is binding on surface owners who may be successors in the ownership to AWDI. This agreement can be extended if there is production on the property. Surface rights were held temporarily by the Nature Conservancy for about three years, during which time the U.S. government passed the requisite legislation and raised the needed cash to purchase the 100,000 acre Baca Grande Ranch in order to establish the new Great Sand Dunes National Park and Baca National Fish and Wildlife Refuge. Attempts by a Colorado Springs lawyer to obtain some of the property transfer documents via Freedom of Information Act apparently failed. Thus, there is reason to suspect that government and business have acted secretly and in collusion in this matter. We would like a full disclosure of pertinent legal documents concerning the transfer of mineral rights to Lexam. Meanwhile, the Lexam proposed drilling comes at a time when the U.S. Congress has not yet defined the mission and purpose of the BNWR. And BNWR has not completed its own Management Plan. And whereas the BNWR denies American citizens’ access to the Refuge because there has been no Management Plan, Lexam has full access. What is wrong with this picture? Additionally, apparently responding to orders from individuals higher up in government, the BFWR tried to issue a permit to Lexam last summer (2006) and then retracted the permit within days after being notified it had no authority to issue such a permit. Nevertheless, the new BFWR stated to our Crestone/Baca community last fall that they did not feel they needed to perform a NEPA process and the drilling could go ahead without the completion of this process. It was only after being sued by SLVEC/WWA alliance attorneys that the BFWR decided they would initiate a NEPA process. On 8/7/07, the BFWR notified the Crestone/Baca community by email that the EA/scoping process would begin with a public meeting on 8/17/07, effectively giving us only 9 days to organize and prepare our public input. Our community was not notified of the meeting through normal publicity channels, such as the Crestone Eagle, which comes out on the first of each month. Our subsequent requests for a postponement of this meeting and then, an extension of the comment period from 30 days to 45 days have fallen on deaf ears. It is hard to avoid the conclusion that the BNFWR is placing the Lexam drilling project on “fast-track,” as per directives from above. Thus, it is quite likely the NEPA process in this case will be a whitewash and a sham. Nonetheless, of course, we hope that it will be a genuine, thorough, and honest appraisal of the many significant impacts attendant upon drilling projects of this scope. I am not a lawyer, but it seems there may be several important constitutional issues here: A) The Nature Conservancy acted as “middle man” in the sale of the land from the Baca Corporation to the USFWS. Was their role legally appropriate? B) Did the Maurice Strong, a Canadian citizen, have the legal right to severe surface from subsurface rights and sell these to different entities? C) Should subsurface mineral rights really be considered superior to surface rights? D) Re: the sale of surface and subsurface property rights, the entities involved include Maurice Strong (AWDI), Gary Boyce (the Baca Corporation), Rob McEwan (Lexam), Baca Minerals, the Newhall Land and Farming Company, Petro-Hunt, Chevron, SONAT, Conoco-Phillips, the Nature Conservancy, and the USF&WS. Were the sales of these properties legal? Or would FOIA information reveal insider deals? Finally, E) should the “property right” of a Canadian corporation supercede those of American citizens and the U.S. government itself? 14) Control of Noxious Weeds: Noxious weed invasion is a significant threat to agriculture and wildlife habitat, rivaling urban sprawl in acres of habitat lost in many rural counties. Studies document that the number one way weeds are spread is from seeds transported on truck tires. In conjunction with local governments, the gas industry must be accountable to mitigate any spread of noxious weeds that may result from drilling operations. We are also concerned about potential impacts to the area’s organic agricultural activities. Management of noxious weeds will apply to all areas disturbed by drilling operations, including but not limited to existing roadways and borrow pits, new roads, pipeline cuts, and well pads. It has come to our attention that the Draft EA will be written by a consulting team that is being paid by Lexam. There is an old phrase: “He who pays the piper calls the tune.” I sincerely hope that this team will follow the NEPA process in good faith, listen to the opinions and views expressed by we American citizens, who really own the BFWR, and conduct not only an EIS but a Management Plan before considering allowing foreign investors to drill on our precious Baca National Wildlife Refuge. A Project of the Grand Valley Citizens’ Alliance. Management Guidelines for Oil & Gas Development (August 4, 2005), Colorado Mule Deer Assoc. My Letter to Dave Montgomery, Board of Directors of San Luis Valley Ecosystem Council Re: Lack of Accounting for the $8700 of WWA money that was raised by the fund-raising letter of December 6, 2006. Thanks for your letter of September 13 in which you thank the Water Watch Alliance (WWA) for helping to protect the BNWR from potential oil and gas development. We agree that WWA will be most effective by maintaining its own autonomy from SLVEC. Indeed, it has always been important that we remain autonomous from SLVEC. We also agree that WWA and the SLVEC face some major challenges in the near future and we also hope we can cooperate in our efforts to keep Lexam Explorations and ConocoPhillips from turning our Valley into an industrial gas park. Unfortunately, since December, 2006, the financial and professional relationship between WWA and SLVEC has been rather poorly-defined and murky. WWA had its beginnings as a group of local volunteers who began studying the potential impacts of Lexam’s gas drilling in about September, 2006. We soon realized that we needed funds to continue our work and since Christine Canaly had begun attending our meetings, she volunteered the SLVEC to become our financial umbrella organization. In December, 2006, WWA and SLVEC sent out a fundraising letter for WWA, from which we raised about $8700. This summer (2007), Christine informed us that she had spent all the funds, and indeed, had used over half the funds to pay herself for work. As I understand it, 501c3 non-profits are under legal obligation to follow rather strict rules regarding the expenditure of funds: Namely, 1) funds cannot be spent without prior approval by a vote of the association, 2) minutes need to be supplied to the group that account for the expenditure of all funds, and 3) non-profits must use appropriate parliamentary procedures in the process of dispersing funds. Our recollection is that: 1) WWA never designated or authorized Chris Canaly to dispense WWA funds, 2) Chris never requested our approval for expenditure of these funds, 3) she never notified us that she was going to spend the funds, 4) she never reported in any minutes how the funds were going to be spent, 5) she paid herself most of the funds (about $5000), and 6) she failed to give our group an accounting of the benefits to our group which accrued from expenditure of the funds and her activities on our behalf. At a WWA meeting in August, I asked Christine to supply us with an accounting of her expenditure of WWA funds. A couple weeks later, she furnished me (E. Karlstrom) with two informal documents, including 1) a document entitled “Chris’s Hours,” a rough accounting of hours she spent on the Lexam issue presumably on behalf of WWA, and another entitled, “Lexam Statement of Activities- Detail, All Transactions.” Whereas the “Chris’s Hours” document mentions WWA twice, the other document does not mention WWA at all. Rather, it appears that she simply assumed the $8,700 belonged solely to SLVEC and that she therefore had complete power and authorization to spend the funds as she saw fit. These documents indicate that of the $8700 raised for the WWA, $3500 were spent on legal fees and that another $4984 were spent on payroll expenses. Christine claims to have worked and paid herself for 195.5 hours on behalf the Lexam cause (at $20 per hour, this totals $3910). The document entitled “Chris’s Hour,” indicates that she paid herself for the following activities: 1) fundraising letter, thank you notes, meeting at the BNWR, going over books, attending Lexam (presumably WWA) meetings at the Manitou Foundation, distributing packets, legal research, meeting with Foundations in Washington DC, writing Lexam press releases, etc. (documents attached). In fact, this document indicates that Christine coordinated her activities with the Manitou Foundation and that she also took a trip back to Washington, D.C. (using WWA money?) Again, however, Chris never informed our group of these activities or of the benefits to our group which might have accrued from these activities. It is important to stress that all other members of WWA have donated their time to the Lexam cause. Thus, it becomes a matter of particular importance if someone in the group should begin to receive pay. Again, this discussion never took place. In essence, WWA is satisfied that the $3500 spent on legal fees is money well spent. However, because Chris Canaly designated herself rather than WWA as the client, members of our group have not ready access to the lawyers or their advice. Even so, we would hope that Christine and SLVEC will keep us informed regarding the progress of this important legal case. But given that we never authorized Chris to pay herself out of WWA funds and WWA never authorized her to spend those remaining funds ($5200), we request that the SLVEC reimburse WWA the remainder of the funds spent without our knowledge or approval, i.e. $5,200. 1) Oil and gas development is completely incompatible with maintaining environmental conditions suitable for a newly designated wildlife refuge. The BNWR has not yet completed its Comprehensive Conservation Plan as required by the National Wildlife Refuge Improvement Act, so they have not even done a comprehensive survey of the species and ecosystems they are mandated to protect and manage for the benefit of the American people. Impacts of developing natural gas on the refuge will likely make it impossible for the BNWR to manage and protect species on that land in anything close to their natural habitat. 2) Oil and gas development is also completely incompatible with the activities and nature of human communities of this area. Crestone/Baca is filled with spiritual seekers and people interested in sustainable development who have retreated to this area because of the spectacular, pristine nature and profound silence of this area. And Valley agriculturalists would also be adversely affected if oil and gas were discovered in this area. 3) There is an estimated 140 + million acre-feet of water stored in sediments beneath the San Luis Valley. Some say it is the continents largest fresh-water aquifer. Gary Boyce of the Baca Corporation devised a scheme to sell this water to Front Range cities for $4000 to 7000 per acre foot. And our freshwater aquifers, both unconfined and confined, occur adjacent to the deserts of the American Southwest, the driest portion of our nation. Imagine the potential value of this resource in the future! It’s in the hundreds of trillions of dollars (140 million times $5000 = $700 trillion!). Furthermore, global warming models show Colorado with 30% less moisture by the year 2050. In addition, the San Luis Valley aquifers feed the Rio Grande River, which runs through Alamosa. And water from this drainage system is currently allocated to three states (Colorado, New Mexico and Texas) and Mexico via the Rio Grande Compact. Surely, any diminution of water quality and quantity caused by oil and gas development in the SLV would therefore adversely affect quality and quantity of water available here and downstream. Thus, the present and future value of the water resource in the SLV is dramatically greater than that of a potential, temporary gas bonanza- and this water resource must be protected and guarded for the future. And clearly, a complete hydro-geologic study of the San Luis Valley aquifer systems is needed to begin to understand the potential impacts of groundwater contamination of any drilling and gas production here. 4) Massive reserves of coalbed methane (CBM) gas are now being exploited in the nearby Raton and San Juan Basins, located about 60 and 100 miles to the southeast and southwest of the BNWR, respectively. Geologically speaking, then, there is a reasonable likelihood it also occurs in San Luis Basin sediments as well. (Coalbed methane reserves for the San Juan and Raton Basins are enormous- and are estimated at 90 and 10 trillion cubic feet, respectively) Using current industry practices, then these fields can support many, many thousands of gas wells.) Extraction of this “unconventional source” of natural gas is considerably messier and more damaging to aquifers than that of “conventional” gas reservoirs. And although drilling techniques are similar to those used for conventional wells, the completion practices and the method of reservoir evaluation are different. Thus, “the BLM has adopted COGCC order number 112-61, which requires that production casing of all coalbed methane wells be cemented from producing horizon to surface by grout circulation methods.” (http://oil-gas.state.co.us/Library/sanjuanbasin/blm/Background/cbch4res.htm). This is done to try to minimize the inter-zonal flow of fluids between producing horizons and aquifers within the casing annulus. Indeed, one of the main methods used to produce CBM is the “cavitation method,” which creates a cavity in the targeted coal seams by altering the velocity of the gas escaping from the coal reservoir. This effectively enlarges the original well bore- thus virtually ensuring the mixing of hydrocarbons, produced water, with aquifer water. And the “produced water” associated with this kind of operation is typically very saline and sodic, so the responsible disposal of this water can be very problematic. (In 1998, the last year for which statistics are available, over 597 million gallons of water were produced from Las Animas County methan wells in the Raton Basin.) Although Lexam claims to be targeting “conventional sources” of natural gas, the fact Cretaceous formations with coalbeds (the Vermejo and Raton Formations in the Raton Basin and the Fruitland and Menefee Formations in the San Juan Basin) overlie the Dakota formation, indicates there is a reasonable chance these formations would be encountered in drilling. Again, double concrete casing of drill holes for the entire 14,000 well would be a minimum precaution. 5) Lexam’s own website indicates that the Cretaceous sub-basin extends both north and south of their recent 3D seismic survey, hence obviously they believe they are targeting a massive gas field. Their exploitation of this resource would bring wind-fall profits for investors, it would also likely have massive adverse impacts on our Valley’s pristine environment and our precious acquifers. 6) Our Crestone/Baca community has the serious problem of very limited access. There is only one road in and out- the County T road. If there is an accident or fire associated with Lexam’s operation, there could be a real disaster here. Therefore, Lexam should not be issued a permit to drill on the BNWR until alternative escape routes have been identified and engineered. 7). If comparisons with other magnificent areas in our Rocky Mountain West are extended to this region, it is most probable that the potential total amount of gas that could be recovered here might be less than the U.S. consumers would go through consumer in two weeks. 8) I have genuine and profound questions about a legal system that would allow a Canadian company to have a “private property right” on American soil that would supercede that of the surface property owner, particularly as that surface property (BNWR) is the U.S. government, i.e., the American people. This means our legal system has effectively granted a corporation (which is a legal fiction) the right to exploit and despoil surface land that the U.S. Congress as designated to be protected in perpetuity for the benefit of wildlife and for the American people. The illegal usurpation of our bill of rights rights by corporations was accomplished in a legal fraud in 1886 known as Santa Clara County vs. Southern Pacific Railroad (please see Hartmann’s Unequal Protection: The Rise of Corporate Dominance and the Theft of Human Rights). And of course the law that gave precedence to the idea that mineral rights are superior to surface rights is the 1873 Mining Act. I would argue that both of these laws are unconstitutional and therefore, invalid. Indeed, U.S. federal and supreme courts have ruled that laws contrary to the U.S. Constitution are unlawful. For example: “All laws which are repugnant to the Constitution are null and void (Marbury vs. Madison, 5 US, 137, 174, 176). And “An unconstitutional act is not law; it confers no rights, it imposes no duties; affords no protection; it creates no office; it is in legal contemplation, as inoperative as though it had never been passed.” (Norton vs. Shelby County, 118 US 425 p. 442). 9) The sequence of economic/legal transactions which has led to this current situation is particularly suspicious, murky, and possibly odious and illegal. Most of what is now the 92,000-acre BNWR was acquired as part of the 100,000-acre Maria Luis Baca #4 Ranch by the agri-business conglomerate Arizona-Colorado Land and Cattle Company in 1962. Canadian billionaire Maurice Strong purchased the property in 1971. Saudi sheik, billionaire, and arms, gold, and drugs dealer, Adnan Khashoggi purchased major shares of the Arizona-Colorado Land and Cattle Company in 1973. (Khashoggi was later associated with the drugs/arms deals of the Iran-Contra scandal of the 1980’s*). Strong, a Canadian industrialist who has been a trusteee of the Rockefeller Foundation, has, at various times, been Vice President of Dome Petroleum, President of Power Corporation, head of Petro-Canada, Hydro Canada, Ajax, Alberta Gas Company, Ontario Hydro (North America’s largest utility), American Water Development Inc. (AWDI), Baca Petroleum Corporation, Baca Resources Ltd., and MF Strong Management. He has also founded and headed numerous non-governmental organizations such as the Canadian International Development Agency (CIDA). Strong has also been one the most powerful men in the United Nations, having organized and directed both Earth Summit I in Stockholm in 1972 and the Rio Earth Summit II in Rio de Janeiro in 1992. He was also the first director of the United Nations Environmental Programme (UNEP), and served on the U.N.’s World Commission on Environment and Development, as well as the U.N.-funded Commission on Global Governance. He also served on the Boards of International Union for the Conservation of Nature (IUCN), the World Wide Fund for Nature (WWF) and the World Resources Institute (WRI), three international NGO’s that have developed and advanced the global agenda since the early 1970’s. Strong, who was appointed by Canadian Prime Minister Brian Mulroney to the Privy Council of Canada, was also involved in huge scheme, called the GRAND, Canal, to divert water from Canada to the United States (www.discovervancouver.com/forum/topic.asp?TOPIC_ID=131262). According to Glen Kealey, one of the main purposes of the water diversion was to create a giant Chicago- Winnipeg food cartel, which was to be managed from Strong’s Baca Ranch. Although this plan was never realized, it also was never cancelled. According to Kealey, some version of it could surface again, as the present political and economic climate under NAFTA/Free Trade agreements make the project more viable. Strong recently cut his ties with the UN after being associated with various UN scandals and conflicts of interest, such as the oil-for-food program and his secret dealings with North Korea (http://www.foxnews.com/story/0,2933,250789,00.html). And he is being sued by San Diego class-action shark Milberg Weiss for dumping his shares of Molten Metal Technology at around $31/share a month prior to the stock’s October, 1996 collapse (two years later they were worth 13 cents/share.). Due to Strong’s and Molten Metal’s ties with presidential candidate All Gore, this issue has surfaced in Senate hearings on corrupt campaign financing (FORBES, Jan. 22, 1996 and Apr. 21, 1997). But back to the Baca: It was Strong who severed the mineral rights from the surface rights on the Baca Ranch. The mineral rights and surface rights have each changed hands several times, subsequently. Lexam Explorations, Inc. purchased their interest in the mineral rights from Baca Minerals and the Newhall Land and Farming Company in 1987. Canadian billionaire, Rob McEwen, CEO of Goldcorp, purchased Goldcorp’s 49.8% share of Lexam in 2005 for $400,000 (Canadian), or 2 cents a share. The last quarterly financial statement shows that Lexam is now worth $12 million. At the time when The Nature Conservancy acquired the Baca Ranch from Gary Boyce’s Baca Corporation and when federal government acquired the Baca Ranch from The Nature Conservancy for about a few years later for about $34 million, the mineral rights could have been purchased for as little as $1 million. Why were the mineral rights not acquired then along with the surface title? Although some our local citizens have tried to find out by accessing the pertinent sale documents through the Freedom of Information Act, they have not been allowed to view those documents. Hence, the question must be asked: Is there a government-corporate plan to control the mineral and/or water resources on the BNWR? Until these issues are resolved in a transparent way, drilling should not go forward on the BNWR. Abraham Lincoln best described democracy as “government of the people, by the people and for the people.” This requires that elected officials and non-elected officials such as Maurice Strong conduct their affairs in transparent and legal manner for the benefit of all. It seems that there may have been a wide departure from these principles in the case of the land deals that lead to the application of this present permit. Indeed, writer Jim Hightower (Thieves in High Places: They’ve Stolen Our Country and It’s Time to Take it Back) documents the systemic looting of federal treasury by the “kleptocracy.” Therefore, until transparency of government is at last achieved and until the necessary environmental studies are conducted in this case, I hope you will see fit to place a moratorium on resource development in this very beautiful corner of the state. Thank you for considering these concerns. We, the affected citizens of the San Luis Valley, count on you doing the right things to protect our environment and our aquifers. Citizens Rule Book: Bill of Rights, Jury Handbook. Whitten Printers, Phoenix, AZ. Dewar, E., 1995, Cloak of Green, The links between key environmental groups, government and big business, Lorimer. Hartmann, T., 2002, Unequal Protection: The Rise of Corporate Dominance and the Theft of Human Rights, Rodale, 360 pp. Hightower, J., 2003, Thieves in high places: They’ve stolen our country and it’s time to take it back, Viking Press, 280 pp. Palast, G., 2003, The best democracy money can buy; The Truth about corporate cons, globalization, and high-finance fraudsters., A Plume Book, 370 pp. People may legitimately have different perspectives and opinions on controversial issues. As a geography professor, I try to see the connections between things, particularly regarding human/earth interactions. My perspective is informed by my many years of university research and teaching about environmental/energy issues. I believe local issues and events are often best understood by placing these in the context of larger national and international economic and political forces. Today, even our quiet and relatively unspoiled San Luis Valley is being affected by these larger forces. Thus, it is imperative that we have a realistic understanding of what “globalization”really is, how it works, who benefits, and who pays. The principles of “globalization” (also sometimes called: “The New World Order”) are well defined in numerous international treaties/organizations like NAFTA (North American Free Trade Agreement), FTAA (Free Trade Agreement of the Americas) and WTO (World Trade Organization); the planned North American Union (NAU); and in countless United Nations policies and resolutions. These “internationalist” institutions and treaties advance and enforce the principle that corporate and private-property rights supercede the sovereignty of nations the rights of citizens. Ultimately, they require the dismantling of the United States of America and the U.S. Constitution. Because I believe it is imperative that local, democratically-elected officials educate themselves on these issues, I attaching my lecture notes on the topic of eco-politics and eco-nomics (from my Human Ecology course at California State University). The extensive bibliography at the end of these notes give many sources that corroborate my interpretations regarding the immediate issues facing our community. I am also attaching various pertinent articles, videos. An even broader perspective can be gleaned by listening to an interview I did with Canadian Alan Watt on KHEN’s “Truth Quest” on October 30, 2007. I include a link to this interview: The last third of the first hour deals specifically with the issues of Lexam, oil and gas development, and the United Nations Agenda 21, all of which directly affect us and our San Luis Valley. This web link and my lecture notes are attached at the end of this message. Amongst the many things we have to be grateful for in the Crestone/Baca area on this Thanksgiving Day are our: 1) ready access to U.S. public lands offering some of the most beautiful and pristine mountain/desert environments in the world, 2) vast expanses of uncrowded spaces, and 3) clean and pure air and water, and 4) profound silence, an asset essential for the many local spiritual groups. Unfortunately, these priceless assets appear now to be under threat- not from Moslem extremists or global warming- two politically correct “public enemies” promoted by our ruling elite and media. Rather, it seems to me they are threatened by two Canadian billionaires; Lexam’s CEO Rob McEwen, and former owner of the Baca Ranch and United Nations magnate, Maurice Strong. McEwen (and Lexam Exporations, Inc.) has immediate plans to pollute our air and water and destroy the silence and pristine majesty of our Valley in order to reap millions and perhaps billions in windfall profits for himself, his shareholders, and his business partners. And Strong, through his Danish wife Hanne’s Manitou Foundation, apparently wishes to cut off American’s access to our own public lands. Could this and the great increase in public lands designation in our Valley relate to the U.N.’s Agenda 21? Why do I link these two individuals and their possible agendas? Let’s review the facts. Most recently, we should be aware that both the issues of Lexam proposed drilling and the potential trailhead closures in the Baca were first made known to our Crestone/Baca community through the Sonoran Institute, a non-profit environmental group. Thus, initial community responses to these issues were influenced by the (un-elected) individuals who volunteered to make recommendations regarding these issues. Second, recall that Maurice Strong acquired the Baca Ranch back the late 70’s, at which time he severed the mineral rights from the surface estate. In the 80’s his AWDI (American Water Development ) tried unsuccessfully to make billions by exporting groundwater from under the Ranch to the Front Range. Although most locals view Maurice and Hanne Strong as generous benefactors who donated land to various spiritual groups, we would be well to look deeper into Maurice’s past activities. If we do so, we see that he is a major player in the “globalist-New World Order” agenda. Strong was also authored the U.N.’s Agenda 21, adopted by the U.S. under President Clinton in the 1990’s. Agenda 21 calls for putting away over 50% of the America land. Although Agenda 21 is justified in the name of protecting nature, many people believe that it has an altogether different objective. Daniel Beckett states: The real agenda behind “Sustainable Development” has nothing to do with protecting the environment. It is about controlling natural resources. If the resources are controlled, the people are controlled.” (I attach a couple articles on Agenda 21 here). Ironically, these Canadian billionaires and their surrogates are now justifying their claims on our land and resources on the basis of their “private property” rights. (Thus, the property rights of rich foreigners now apparently supercedes the rights of the U.S. government itself as well the American citizens who actually live in this area). Am I dreaming, or have we returned full-circle to a new “Age of Robber Barons,” with the modern twist that today’s super-rich are an international elite with little or no national allegiances? Certainly, by virtue of their incredible wealth, these globalist/monopolists now claim ownership of land, water, air, and energy resources everywhere throughout the world. They justify their ownership claims with words like “privatization,” “de-regulation,” “free trade,” and of course “private property.” And, of course, their agenda is greatly aided by the impotence and/or complicity of local and national governments; governments originally instituted to protect the interests of the majority of people against the continual predations of the rich and powerful. You, the POA board and County Commissioners of Saguache County, are the duly elected representatives of the citizens who live in the San Luis Valley. I would ask you to consider the irony of the fact that the individuals who now lobby you so persistently to close off local trailheads and access to our public lands are disproportionately of foreign origin. These include Christian Dillo from Germany, Martin McCauley from Britain, and of course, Hanne Strong, from Denmark and her husband, Canadian Maurice Strong. My concern, of course, is that by cutting off American’s access to public lands may indeed be the immediate goal of Agenda 21, and this agenda should be resisted by citizens and local governments whenever and wherever possible. Of course, our country is a nation of immigrants, and we have a distinguished history of welcoming them. My own grandparents are from Sweden, Canada and Wales. Thus, I was gratified to learn, while bicycling across Sweden in the 80’s, that in Sweden, any traveler has the right to camp on anyone else’s land at any time. This is called “every man’s right” and it seems to me to be a very civilized way to organize things. Certainly, Hanne Strong must know about this enlightened Scandanavian tradition. Similarly, it is commonplace for public trails to traverse private land in England. Indeed, in England, if all such access points were closed, there would be little or no public opportunity for hiking at all. At the public meeting on September 15 at Colorado College on the subject of the Northern Access Team’s recommendations, a young couple from Boulder, Colorado who own the lot at the top of Pine Cone (which hikers, myself included, now traverse to get to the Willow Creek and South Crestone Creek trails) made it clear that they purchased the land so that hikers could continue to have access to these trails. Does it not seem strange that in regards to this issue, this couple is behaving in a more generous and public-spirited manner than some of our own local spiritual communities? Is this the kind of country we want, where only the super-rich have access to beautiful places? So I ask you to assert your authority for the benefit of the common citizens who inhabit this great country. That way, we may continue to be grateful on future Thanksgiving Days. In particular, I would ask that in regard to the proposed drilling by Lexam Explorations, Inc. that you do everything in your power to stall and/or prevent this potentially disastrous activity by finding some county regulation or restriction that would delay or block the proposed drilling. And in regard to the proposed closure of trails accessed through the Baca Grande, I hope you will continue to honor and uphold the County Commission’s Resolution of 1996 and which was printed in the November Crestone Eagle. I have always told people that the San Luis Valley is more than a home to me. It is a spiritual place unlike any other on earth. We in the San Luis Valley of southern Colorado live in a unique and spectacular place; indeed, this valley is a priceless, national treasure. Considered North America’s largest, alpine agricultural valley, the San Luis Valley is surrounded by the spectacular Sangre de Cristo Range on the east and the San Juan Mountains to the west. It contains the highest sand dunes in North America (The Great Sand Dunes National Park) and the adjoining Baca National Wildlife Refuge (BNWR), which protects a vast network of wetlands that are amongst the most pristine and biologically diverse in the American Southwest. Significant elk, antelope and deer herds, over 45 rare, threatened or endangered species, and some of the oldest archaeological sites in North America, dating back some 11,500 years, are here. The Pueblo, Ute, and Navajo peoples consider this valley and Mt. Blanca the most sacred places in the world. Over 20 spiritual groups, representing a variety of religious traditions, have retreat centers here because of the profound silence and pristine quality of nature. But perhaps most important for future generations, this valley is underlain by one of the largest reservoirs of clean groundwater in North America, including an estimated 140 million+ acre-feet of potable water (Pearl, 1974). In August, 2006, Lexam Explorations, Inc., a Canadian company, applied for permits to drill two 14,000-foot exploratory gas test wells on sensitive wetlands in the BNWR about 1.5 miles west of our community. Initially, BNWR officials told us they were NOT obligated to conduct a NEPA (National Environmental Policy Act) process because Lexam owns the mineral rights underneath the refuge. However, after our lawyers sued, a federal judge instructed the BNWR that they are legally bound to conduct a NEPA process. So on August 17, 2007, the BNWR initiated an Environmental Assessment (EA)/scoping process at a public meeting where they instructed us to submit our concerns in writing and informed us that, by law, they were obligated to address and respond to our concerns in the EA. As you know, Governor Ritter, NEPA was established to insure public and scientific input to determine whether or not a proposed activity on federal land would result in “significant impacts” to local physical, biological, and cultural environments. Whereas activities with “significant impacts” require full-scale Environmental Impact Statements (EIS), those with “no significant impacts” require the much less comprehensive Environmental Assessment (EA). On January 18, 2008, the BNWR released the Draft EA, written by ENSR, a private contracting company paid by Lexam. Given this inherent conflict of interest, it is not surprising that the EA is a FONSI (“finding of no significant impact) even though the proposed drilling activity meets all ten criteria for “significant” defined in NEPA. ENSR and BNWR apparently used several devices to justify their FONSI conclusion. The Draft EA: 1) assumes a priori (but never proves) “no significant impacts,” 2) ignores the NEPA definition of and overwhelming evidence for “significant impacts,” 3) ignores the substantial number of questions and concerns which citizens submitted in writing, 4) does not address impacts at all, and 5) limits the assessment to the drilling of exploratory wells, not acknowledging that this “precedent-setting” activity could result in significant “cumulative” impacts if gas production occurs. Indicative of the conflict of interest here, at the public meeting, William Berg, oil geologist and main author of the Draft EA, challenged our community to prove that drilling would contaminate groundwater. Although it is impossible to prove future occurrences, there is an abundant record of gas drilling accidents that have polluted wells, springs, ponds, etc. Regarding EnCana’s gas drilling near Silt, Colorado, for example, Peggy Utesch (Grand Valley Citizen’s Alliance) stated, “We know that every day there are accidents in the field – just look at the (COGC) Commission’s reports.” Indeed, gas-drilling accidents recur worldwide. The purpose of the BNWR is to restore, enhance, and maintain habitat for wildlife, plants and fish species native to the San Luis Valley. Water is a vital and irreplaceable part of this protection. We believe that we have raised legitimate concerns regarding the adverse impacts to water and the BNWR that have not been addressed through the NEPA process to date. We also believe that some places are best managed for other uses besides energy development and the Baca National Wildlife Refuge is one of them. BNWR representatives have apparently now redefined NEPA in such a way that their only responsibility is to mitigate Lexam’s drilling activities. Thus, it seems that representatives of the BNWR, Lexam, and ENSR view the NEPA process as a “done deal.” Whereas we are participating in the NEPA process in good faith, we question whether the USFWS is following the NEPA process honestly and fairly. They did not respond to the many concerns we submitted during the EA/scoping process, as they promised they would. So we are concerned that the comments and concerns we are now submitting to the BNWR during the present public comment period will be ignored, just as they were before. And we are also concerned that in this process, no official group is representing the interest of the most valuable part of the BNWR “estate”, which is the water that belongs to the people of Colorado. Finally, we feel that, in this case at least, the property rights of American citizens, the U.S. government (the BNWR), and the state of Colorado (the water) should supersede those of a Canadian corporation. For more information, please check our website: http://WaterWatchAlliance.googlepages.com. Although we know you have many diverse interests to balance, we ask you, Governor Ritter, to please consider helping us protect and preserve this unique, special valley as a NO-GO (No Gas and Oil Drilling) Zone. We urge you to place a moratorium on oil/gas drilling until base-line water studies are conducted on our aquifers to help us understand their importance to this valley and to fulfilling Colorado’s commitment to the Rio Grande Basin Compact. Cc: Senators Ken Salazar and Wayne Allard, Representative John Salazar, Senator Gail Schwarz, David Neslin (COGCC), Jay Slack (U.S. F&WS), Jim Martin (Colorado Dept. of Public Health), Harris Sherman (Colorado Dept. of Natural Resources), Senators Barack Obama and Hillary Clinton, various newspapers. I came away from our conversation with the strong sense that you and USFWS really need to assume that Lexam drillers are going to hit a big gas field. I say this because 1) those three wells are already permitted for production and they will automatically start producing if they hit something- without any further NEPA studies, and 2) they have lots of good data, including really good seismic data, to go on. So again, we need to understand what a “gas boom” looks like. In that regard, it’s too bad that you missed Tweeti Blancett’s talk in Del Norte last night. She was invited to speak on the gas and oil drilling in the San Juan Basin that has put her ranching family out of business. Of course, she was invited to speak because of the BLM and Forest Service’s plan to lease 144,000 more acres to the gas and oil industry in the San Luis Valley. Tweeti made some excellent points in her presentation, which I’ll summarize here for you. 1) She stated and repeated numerous times: “All the surface water on our old ranch (a BLM lease) is contaminated, rivers, dams, stock ponds, springs, lakes, all of it. Contaminants are everywhere. So we called and asked them to test the water.”- But curiously, whereas independent testing showed lots of pollutants, industries reps found no contamination and the government’s reps lost the samples. She noted there was never any baseline water quality testing on their rivers. 2) There is no enforcement whatsoever of the rules- by federal, state, or local governments. 3) Illegal dumping of toxic contaminants is occurring throughout the San Juan Basin because all the legal places to dump toxins are full. 4) Our Rocky Mountain West is systematically being destroyed- from Montana to New Mexico, including the Roan Plateau, the Tetons and Yellowstone, etc., etc. (And then we all watched the movie: “A Land Out of Time”- I can send you a copy if you haven’t seen it. 5) We must be willing to fight. It is our right to fight to protect our land, water, air, lifestyles, etc. We American citizens have standing and must fight for our land- because no one else will. The courts are listening to us. 6) There is now a moratorium on drilling in the Galisteo Basin near Sante Fe, NM until they do adequate water studies and get some base line studies on their aquifer- and the potential impacts of drilling to the aquifer. The moratoriums were placed by the Governor and County Commissioners even though leases had already been granted. 7) Our main allies include the Salazar brothers and Tom Udall (Congressman in New Mexico) who helped protect 100,000 acres in the Valle Vidal. 8). A class action suit for damages in the San Juan Basin would be a waste of money because of the extreme wealth (she mentioned $8.2 billion) and power of gas and oil companies. 9) However, there are currently lawsuits in progress in Lovington, because gas and oil drilling has contaminated the Ogallala aquifer there. 11) Government and industry keep federal employees in the dark. We should blame the White House and industry but work with local federal employees because they can be very helpful- and they mean well and typically are as ignorant as we are about what’s going on. 12) Oil and gas pays great wages- but drugs and alcoholism is rampant wherever they go. 13) Government and industry don’t treat Indian land any better than the other land. 14) Surface Occupancy rules are typically waived. 15). Industry is capable of drilling from 14 to 48 holes from one pad using directional drilling. (One oil/gas worker present said his company typically drills wells 15,000 to 20,000′ deep using directional drilling). 16) Lean on public land people to get safeguards. 17) Fumes, haze, smog, and air pollution from the rigs is a real problem, especially in winter when there are temperature inversions, such as we commonly have in the SLV. 18) We can ask for a limitation as to how many rigs can operate at one time. 19) The BLM and FS lease area includes three big tributaries to the Rio Grande. Polluting these tributaries will pollute the Rio Grande. 20) She repeated that, yes, we all need gas and oil, but “At what cost?! !” The health of our natural environment, our communities, our families, and our way of life, etc. are more important than the obscene profits (usually with low severance taxes, as in Colorado). Therefore, there are many places that should be off limits to oil/gas drilling. 21) But the Bush/Cheney administration is in bed with the gas/oil industry that they are now doing everything they can to get into all the best, most beautiful places now, knowing that when their term is up conditions may not be as favorable to industry. I hope this helps you visualize what could happen to the BNWR and the entire SLV if a gas boom were to happen here. Again, if you’d like to see the excellent movie – A Land Out of Time- that shows the scope and damage of drilling throughout the West- let me know and I’ll be happy to loan you my copy. So it might be a good idea to print these out and look them over- kind of to inoculate ourselves to the techniques described. We certainly don’t ever “all have to speak with one voice”- as some in our community keep trying to advise us. The basis of democracy is we all speak our own minds and our own thoughts. Otherwise…… tyranny. Copyright © 2019 San Luis Valley Water Watch. All Rights Reserved.